Here it is! The return to Team Stryker Mission 003 you have all been waiting for! 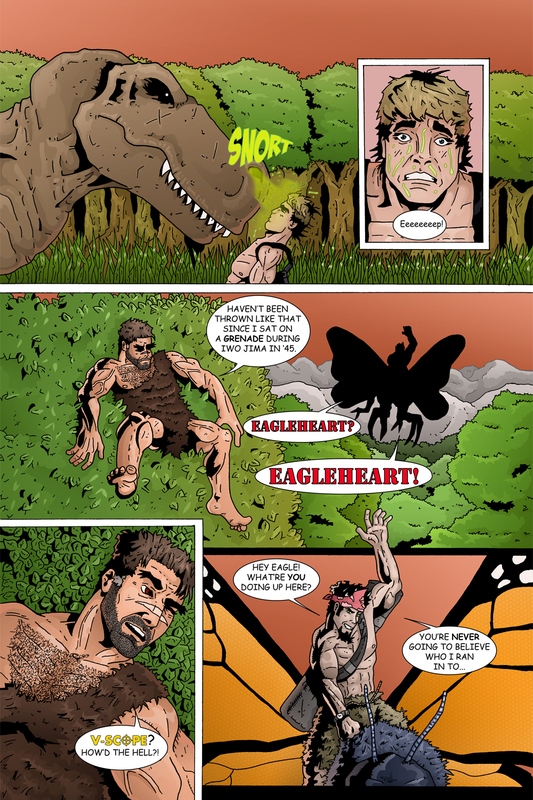 Hopefully the wait has been worth it as we see what happened to Eagleheart when he got thrown from the T-Rex in page 17. We also get to see the (kinda) triumphant return of V-Scope! V has the unnatural ability to disappear just when things are heating up only to stumble back when he is needed (or not). For those of you who are late to the Team Stryker train you can start Mission 003 here, Mission 002 here and Mission 001 here. Hope you enjoy getting caught up and are ready for an exciting 2013 with Team Stryker! Have a great start to your year and I will see you all back here on Monday for the next exciting page of Team Stryker! You won’t want to miss it.